What, I thought, was to prevent me from truly killing the author? Part murder mystery and all jet-black satire, and based on a real life scandal, this edgy novella tells the story of Léopold Sfax, world-renowned as the creator of "The Theory"—a bizarre literary theory that grew from an intellectual folly to a dominant school of criticism that enslaved college campuses across the country. However, The Theory, which holds that the text of any piece of writing tells us all that we need to know about its author (as if the author himself is "dead") takes on extra perversity when the revered—or is it feared?—Sfax is found to have once written something that seems...well, murderously revealing. In the hands of Gilbert Adair, it's a dexterously wrought and hysterically devilish look at academic cultishness. It's also a taut metaphysical murder mystery that confounds the reader's expectations on almost every page and reserves its most stunning surprise—the ultimate whodunit twist—for the very last page. The Contemporary Art of the Novella series is designed to highlight work by major authors from around the world. In most instances, as with Imre Kertész, it showcases work never before published; in others, books are reprised that should never have gone out of print. It is intended that the series feature many well-known authors and some exciting new discoveries. And as with the original series, The Art of the Novella, each book is a beautifully packaged and inexpensive volume meant to celebrate the form and its practitioners. Gilbert Adair was born in Edinburgh, Scotland, in 1944 and moved to Paris as a young man, because, as he told an interviewer, "If you were a film buff in the sixties, you went to Paris." 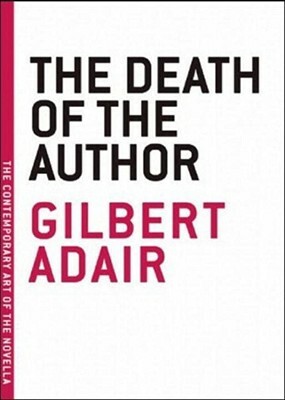 Adair later returned to the UK and spent his time writing experimental fiction, as well as film and literary criticism. His works include "The Holy Innocents," later made into Bernardo Bertolucci's film The Dreamers; "The Postmodernist Always Rings Twice," a book of literary criticism; and the novel "Love and Death in Long Island." Adair lives in London. "Funny, gripping, and very clever... A brilliant black satire on cultural cultishness... It also works brilliantly as a detective story with apparently motiveless murders." "The Death of the Author brilliantly combines a serious critique of a dodgy intellectual movement with a suspense-driven detective story." "In a brilliantly exact imitaton of the style of Nabokov, Leo Sfaz recounts his life-and-death story. Once a pro-Nazi journalist in France, now an academic hero in somewhere very like Yale, he applies the fashionable technique of deconstruction (text means anything the reader wants it to mean, the author's intentions are nothing, text does not really have authors) to conceal or invert his own ignominius past. But some neat muder mystification is found a place in this dazzling satire of literary-critical pertension."